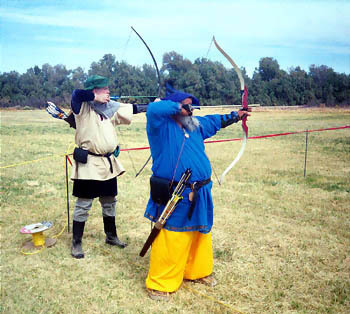 Welcome to Medieval Archery...Alive and Well in the Modern World...aka the 'Current' Middle Ages! Greetings goode and kynde gentles of both the Knowne World (Society for Creative Anachronism and other kingdoms) and the mundane one...the 'normal' one we live in. My name is Philip L. Boddy Jr. I have rekindled my childhood need for an active hobby and Medieval Archery fits right in. Not that fencing, rapier dueling, compound bow 3-D shooting, and amateur gold prospecting are necessarily 'armchair' endeavors. But, there is something to be said about a grassy field, the colourful target faces daring you, the whisper of your longbow string as the limbs suddenly straighten, the blur of brightly coloured fletching winging downrange, and, if the gods are with you, the quiet 'pop' as your arrow hits the gold...ah, maybe red...or blue? Most people on the North American continent have seen the movie 'Robin Hood'-either the Errol Flynn or the Kevin Costner version. In the Medieval Societies, there is a saying; "Live the Dream." The wonderful aspect of this is that they mean it. Some people go to the Renaissance Faire once a year and see the commercial part of it. We of the Knowne World live it, at least once or twice a week, by dressing in the clothing (garb) and enjoying whatever endeavors we individually pursue. It is like going back into a life one can only remember reading about as a student in the distant past. The members have a saying about one's involvement in all this. It is called 'playing'. We 'play' in the various endeavors and kingdoms. It should be noted here the safety and martial aspects are taken very seriously. These activities are governed by rules and the practice is observed and administered by trained marshals. But, having fun is the letter of the day. So, if you have ever wondered what it would be like to be out among people dressed in Medieval clothing, displaying unique courtesies towards one another, and just having a really entertaining time, come join us! My archery days started at day camp when I was 6 years old. It was formal enough to get me happy about stringing my own bow and getting an arrow into the target's coloured rings a few feet away. A couple of years later I had a brainstorm. I took a $1.50 toy bow and arrow set and did a conversion. Glueing split bamboo chopsticks to the front of the bow, I then wrapped it tightly with wet rawhide boot laces. The arrows (real feathers back then even on toys) were modified with mom's nail files glued and wrapped into the tips to make 'real' arrows. Three good shots into a tree at Lincoln Park across the street from my apartment and my Huron warrior days came to an abrupt halt. The cops would sometimes call me the Irish Indian laughingly. I seem to remember they weren't laughing the day they took the bow away and tried to pull the 'toy' arrows out of the tree. Ah, the 'Spirit of the Bow', as they say... the spark was kindled for the future. So...How Did I Get Involved? A teacher buddy of mine got me into archery after a 33 year hiatus. He is a cam bow shooter and showed me his rig. Through him, I shot in an indoor league with a used Hoyt Buck cam bow I kept bare of pins or sights. I was perusing his Cabella's catalogs one day and found longbows. When I got the Jerry Hill 55 pounder, I was amazed at how light it was in weight. After a week of finally remembering to use my back muscles as well, I was able to draw it. There is something hypnotic about the quiet "thum....wheck" of the arrow release and target strike. Now, to find the traditional archers I had heard stories of. I was rewarded one Sunday morning when I turned the corner of street at the archery range in a local park. There, before me, were laughing people dressed in their finest Ivanhoe/Robin of Locksley garb. The targets were the familiar coloured rings on stands. There was even a special target for the kids at about 10 yards. At last, I was home! Now...to convince my daughter that my new granddaughter needs a Medieval name and a longbow...I'll just have to put on my thinking cap...You know, the green one with the feather in it! 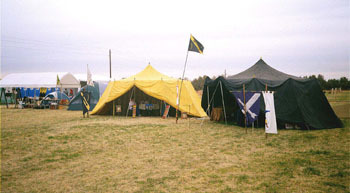 2) A Portion of The Archery Encampment at Estrella War XVI Adjoining the Range. This is His Excellency Baron Black Arrow's household encampment. 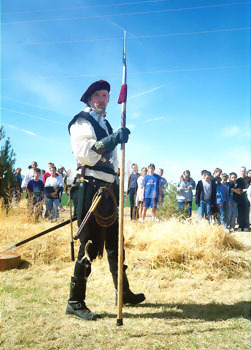 He and Sir Waylan of Winchester were the first to welcome me into the archery traditions at the Kingdom of Umbria tournament in the Spring of 2000 at Estrella Park. His Excellency (you need to address people by their rank...Hey, "RHIP") Baron Black Arrow and M'Lady Marquerite initially told me "...yeah, but remember, are you having FUN? That's what it's all about." 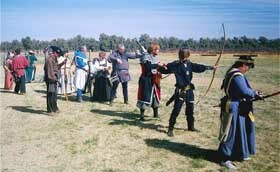 3) Medieval society lords and ladies loosing arrows on the Estrella War XVI archery practice range. In the background are some challenging and entertaining ranges for scoring. Some of these involve moving targets and dastardly blokes or villians. 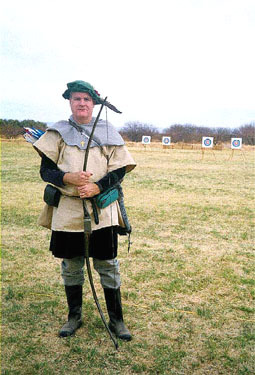 Like any archery range, there are line marshals and safety is always a priority. 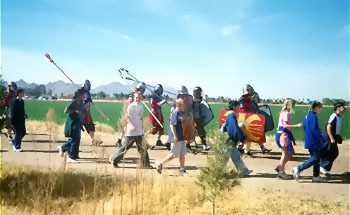 The above pictures are from the annual Estrella War held in Arizona. This one was my first and certainly not my last. These are members of the Kingdom of Atenveldt and other kingdoms from other states. 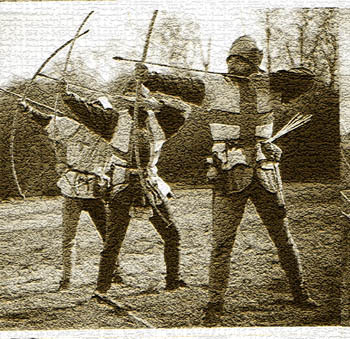 I also have pictures of members from the Kingdom of Umbria engaging in archery events on the following pages. This is my first attempt at a web page. Please be patient and check back every so often. 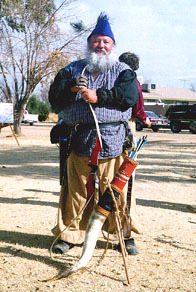 I'll be adding links to 'Goode and Kynde Gentles' who are merchants in the archery and medieval world. Thank you for your time and perusal of my site.